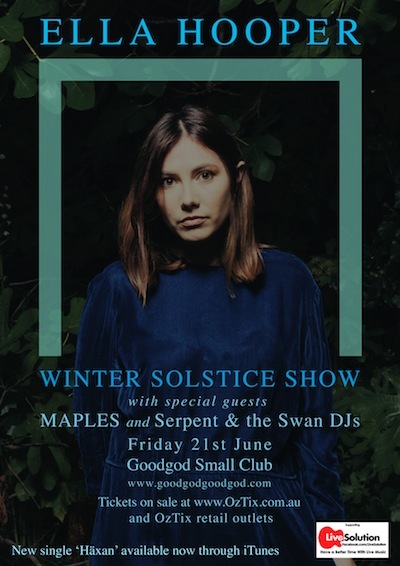 Ella Hooper rings in the Winter Solstice at Goodgod with her first ever Sydney solo show! Ella’s solo material has been causing waves and ripples over the last few months with singles Low High and Haxan moving towards a smokier, dreamier yet raw and tough palette, both sonically and lyrically. In celebration of the Solstice, a fascination with the feminine mystique and all things ‘witchy’ (current single Haxan translates to The Witches), Hooper has assembled an all star line up of ladies with main support from the brilliant MAPLES – solo project of the lovely Gabby Huber of Dead Letter Chorus fame. MAPLES debuts her new 3 piece backing band and material from her soon to be released debut album. To boot, beloved local fashion label Serpent & the Swan will provide DJ duties. As lovers of dark, poetic and raw themes the designer-sisters are the clothiers of choice to many discerning muso’s, and will be spinning everything from Stevie Nicks to Zola Jesus, bringing the Solstice vibes.. there may also be giveaways involved. Stay tuned!